Bay Spas Hot Tubs and Swim Spas was established in 2003 and is a leading supplier of spas and hot tubs covering Devon, Somerset and Cornwall. We have a wide range of hot tubs for sale and for hire in our Devon showroom. We have a number of different ranges of spas and hot tubs on offer for people in the South West region, ranging from value hot tubs right up to the top of the range.We provide a hot tub hire service, a great way to tell if a hot tub would suit you on a permanent basis or if you just want one for a party. Alongside the Michael Phelps Signature Swim Spa, Bay Spas are also proud agents for the Aegean / Master Spa range of hot tubs and swim spas since 2003. For as little as £2,999 you could be enjoying one of our hot tubs or swim spas. These are award winning hot tubs boasting the latest features available in a wide range of sizes. Bay Spas is the local dealer for the Master Spas LSX range and always has a selection available to view at our showroom. 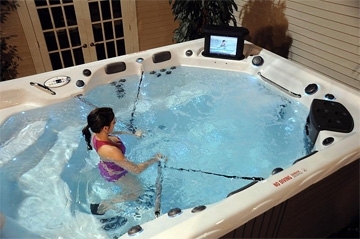 Hot tubs and swim spas are not only good for relaxation, but also for exercise. The health benefits of hot tubs are becoming more and more well known, and we can help you choose the right system for you, suiting your requirements and location. 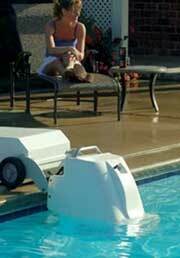 Bay Spas prides itself in putting customers first, ensuring that the product you choose is the right one for you. Come along to the Bay Spas showroom where you can see a sample of the hot tubs that we can supply. If you wish, you are welcome to bring your swimming stuff and tryout a demo hot tub. Or, if you would rather, you can simply phone us for further details and a brochure. If you already have a swimming pool, and are looking for a new way to exercise, Bay Spas can also provide you the ExerSwim, a solid, self-contained, rechargeable unit suitable for most swimming pools. Simply place the ExerSwim in one end of your pool, and it will generate a current for you to swim against, allowing you to benefit from strength and endurance building exercise with a low impact on joints and muscles. As well as our range of hot tubs, we also stock hot tub chemicals, accessories, covers, parts and filters for a range of hot tubs to ensure your system stays clean, hygienic and running properly. UK (Ilfracombe, North Devon) based firm offering hot tubs and swim spas for sale. Website features catalogue of products, testimonials, photo gallery, brochure request facility, full company contact details (found at footer of each page).